Chillax® Pineapple Gold is an American beer, it has an alcohol content of 4.5%. 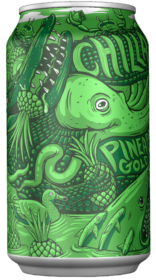 A delicious Golden Ale infused with real pineapple that gives it a tangy, sweet, subtle taste of the tropics. A great, light refreshing beverage all year round.